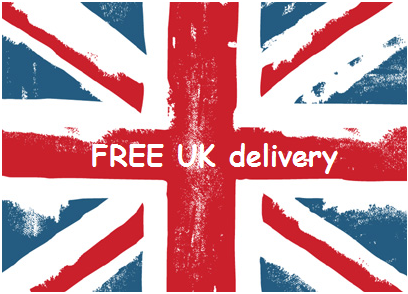 Who am I to refuse 25% off and FREE next day delivery? I ordered on Wednesday afternoon at 2pm and I had my clothes for 10am Thursday morning - now that's what I call service! My mum and aunt were with me so I was very excited to hear what they had to say about my ordered items. I have seen that they do this in their tall range so I am quickly off to order, but before I do what do you think about the seams not matching in stripe? It bothered my mother so much (I'd not even noticed). VERDICT: Too short, returning for the tall range if I can get over the mis-match of stripe pattern on the seam! I really wanted to love this BUT it had a very saggy crotch that I kept trying to hoike up and then that pushed the waistband up and then down as I tried to make it look good again and then we're back to the saggy crotch problem. I didn't feel at all comfortable in this even though I LOVE the wide neck. I couldn't even get it on! It's a size 10 which I thought I was so this dress runs SUPER SMALL. It has no buttons or zips and it's a tight fabric (good for holding in and structure) but impossible to get on! I tried 3 times but each time had to be helped out with it STUCK over my head and shoulders! I think I may re-order in a 12 because the colour and design is epically (made up word) gorgeous. ME: Ooh I love them but they are too hard, no give and don't fit my feet properly, same for the peach, the ballet shoes and whilst I loved the red shoes they don't love me, they're too rounded on the toe, I don't like the look of them on me. Mum: Lovely colour but agree they don't fit properly. I don't like the red heels, very fuddy duddy. The peach ones look tacky. Do you see the gaping toe gap? Maybe it's my strange feet??! Here is how shoes can make an outfit. 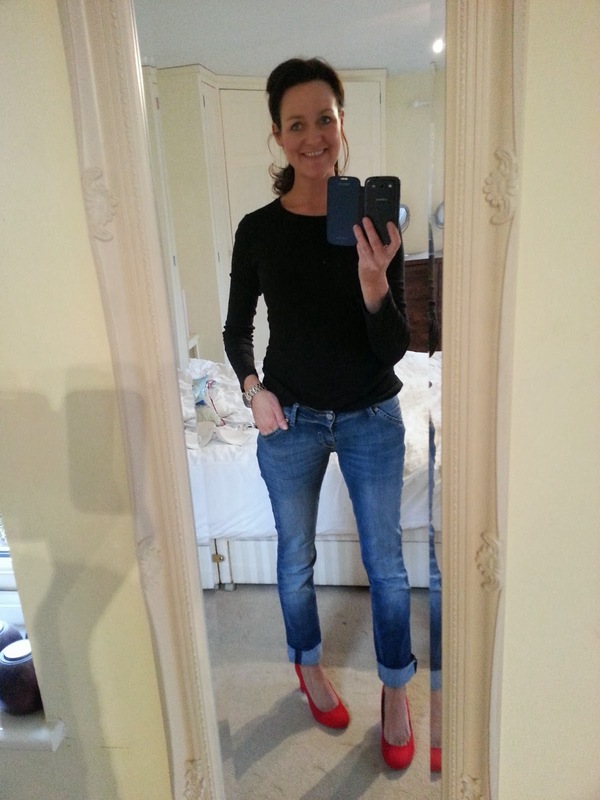 As I was prancing around the bedroom I put on boyfriend jeans rolled up and a simple black tshirt and then the heels - I love this outfit and am so desperate for Spring to spring so I can wear this more often. Let me know if you have ordered anything from Dorothy Perkins in the past week, if so what? 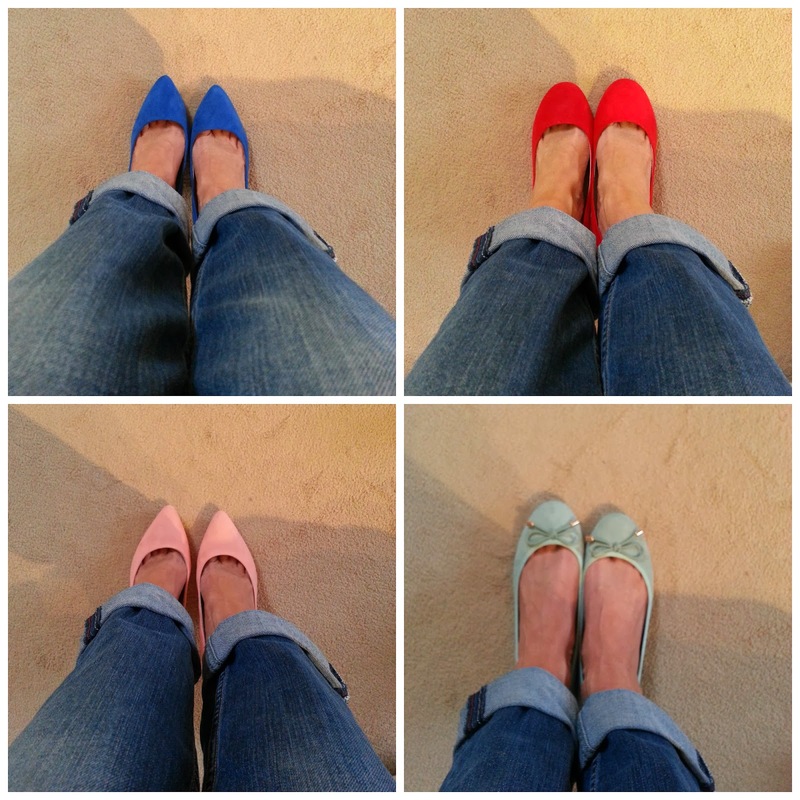 Next blog post - what I bought whilst picking up some bread from Tesco! 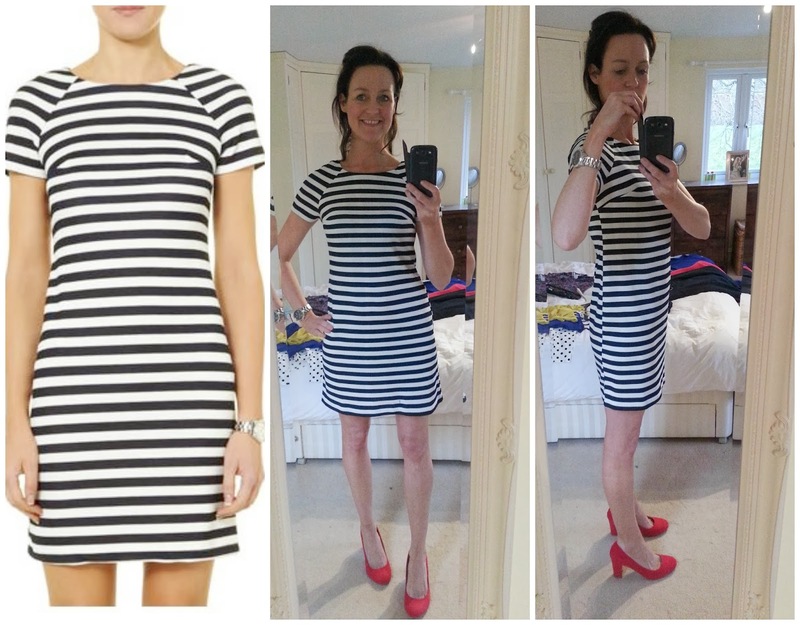 Fiona, I love the look of the stripped dress on you and you have the gorgeous legs to carry it off. But I would also be bothered about the mismatch stripe. Love it with the red shoes too. I think it will bug me now I've seen it! Love the dialogue that went along with this 'show and tell'!! I tell you now ... when Susie So So sees the mismatching stripes she's going to be very upset indeed! It's one of her bugbears. And love the final outfit - can see why you wish Spring would hurry up .. don't we all! It will set her teeth on edge!!!! Fun post! Love having mom & auntie along for the ride! Maybe I should get them featured some more?!!! Yes the stripe dress is great but the seam mis-match would bother me. However, if you order the long you never know, you might get one with a closer match! 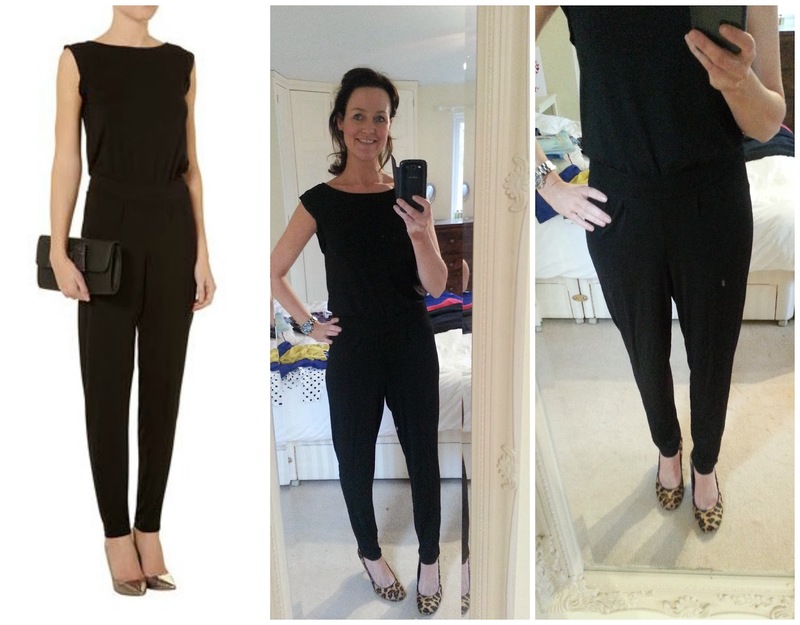 Fab post Fiona & I love your last outfit. 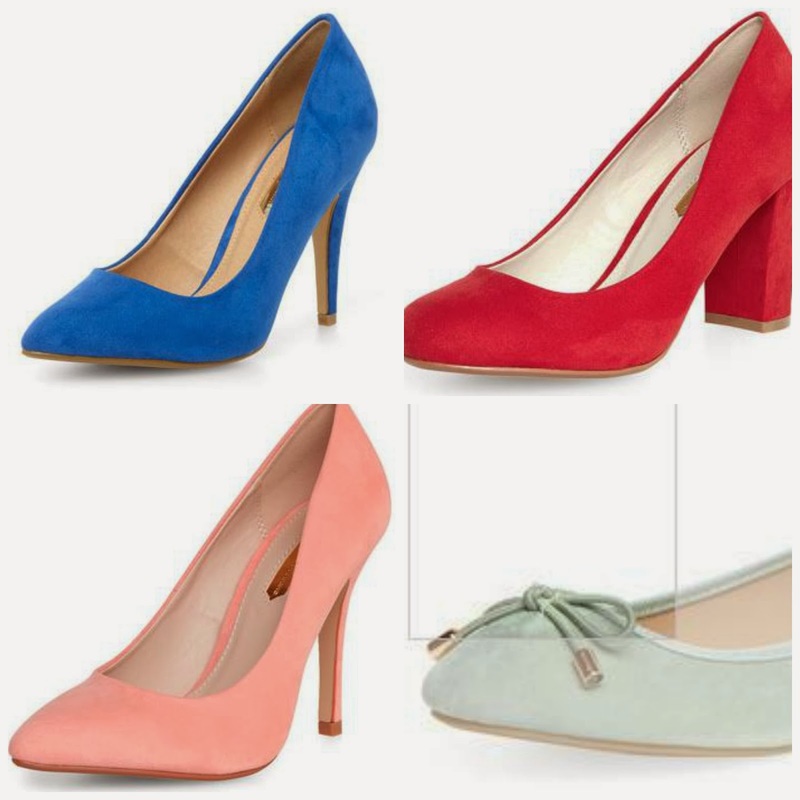 I'm on the hunt for some cobalt shoes too...just ordered some from good old M&S - keeping fingers & toes crossed!! That Helen! But she's right, the mismatched stripes on the dress is an absolute no no. The length looks okay because you have the legs to carry it off but the stripes N.O. By the way - can we have your auntie and your mom around again. They're fab! I can hire them out if you are interested! Totally agree - why couldn't they have gotten the stripes to line up?! Fab dress otherwise, I didn't think too short but it's what you're comfortable with. I am 5'9" too and also struggle with the length of some items. It doesn't look too short from the photos but it was. really? Oh ok I'll try it on again and see what I can do with it more! Love the stripe dress....fingers crossed it works out in the tall range....maybe the matching of the stripes will be better on the next one?! I would wear it with flatties instead of heels but that's just me! Think the Uniqlo one that I got maybe a bit short for you as I measured it and it came up at 33" from shoulder to hem. LOL at the aunt and mother being the star of the show! This is MY blog don't you know?!!!! I should hire them out for fashion bloggers - they do give you an honest opinion that's for sure!